If you are passionate about wine, there are a few places in the world that give you goosebumps at the mere mention of their name. Places like Burgundy, Bordeaux, Mosel, Rioja, Tuscany, Napa Valley, Margaret River, Mendoza, Willamette, Wachau. One of the most important places is Piedmont, and more specifically the Langhe, where some of the greatest red wines in Italy are produced. If you haven’t heard of the nebbiolo grape, then you have possible heard of Alba, its official home. Alba is to Italy what Burgundy is to France; cool climate, rolling hills, centuries of tradition, identified sites. The nebbiolo grape has many similarities to the pinot noir grape as well, and it has been suggested that very old burgundy is almost indistinguishable from very old barolo. Compared to burgundy, barolo and barbaresco is great value, but it can still take a dent out of your hip-pocket (if that makes sense). The there’s always Nebbiolo d’Alba, or Langhe Nebbiolo. And if this is still a bit steep, there are numerous other varieties you can imbibe, both red and white, still and sparkling, sweet or dry, from this wonderful part of Italy that would take several months to do properly. As it is, I only have four days on this trip, and have restricted myself mostly to Alba. The Colla name has been linked to wine in Piedmont for over 300 years, but like a lot of Alba the historical winemaking bears little resemblance to what it is today. For the first 200 years viticulture and winemaking was mostly of the moscatello grapes, with large volumes of sweet wine, with some rose and red wine sprinkled in. 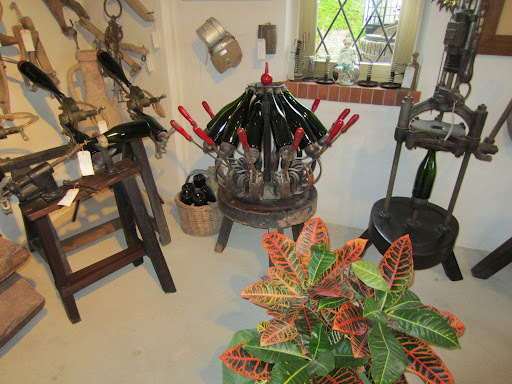 Similarly the wines were sold in casks rather than bottles. About 100 years ago 15-year-old Pietro Colla learnt the metodo classico from the man who imported it from Champagne, and thus a star was born. He employed these techniques on his own mostly moscato vineyards and began selling his wines domestically and in various export markets. As the region began to be known for sweet and vermouth wines, there was much investment and subsequent increases in volumes, and still wasn’t as well-known for dry red wines as it is today. Former owners of the famous Prunotto estates, the Colla family were one of the first to produce single varietal single vineyard wines that also took inspiration from the French Burgundian model. Upon selling Prunotto in the early ’90s, the Poderi Colla winery was born, and has established itself for its quality, only making one wine per variety, highlighting the best cru for each. Latest generation Pietro Colla works as a oenologist, and introduced me personally to the estate. Three vineyards make up the 26 hectares of plantings, 80% of which is to nebbiolo; Dardi Le Rose is within the Bussia cru of Barolo, 80% of the Roncaglie vineyard is owned, and the Cascine Drago in the Alba DOC is where the winery itself lives. 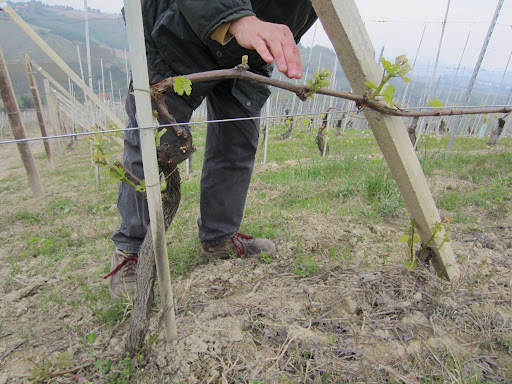 Pietro took me up to the top of the Tenuta Roncaglie vineyard, where white clay, limestone and chalk soils are hard-packed from recent rain over Easter. There is a noticeable difference when you compare the nebbiolo and barbera vines, as the barbera are much more densely planted and have less than five nodes per cane left, compared to the lower yielding nebbiolo which has at least eight. 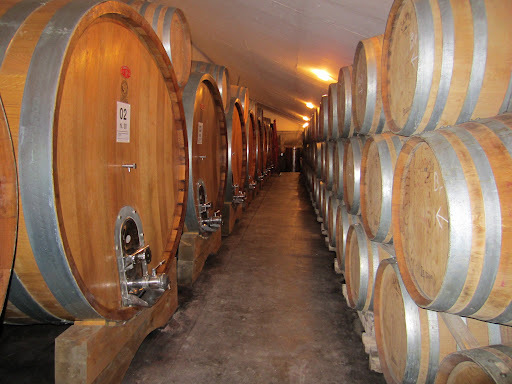 In the cellars they use very minimal oak, no new, to allow the terroir to speak through the fruit and wine. In winter they can perform cold stabilisation of wines by simply opening the winery doors and allowing cold air to enter. Budburst has just begun, and on days with good weather they are de-suckering the vines to thin shoots and control the yields. Poderi Colla was one of the producers I met with during Vinitaly and tasted many of the new wines, so it was nice to try some wines with bottle age to get a better understanding of them. Click here to read my tasting notes. Click here to see more photos from Day One in the Langhe, Italy.